Abbotsbury in West Dorset on the southern coast of England is a large village steeped in history. The village is situated on The Fleet under the limestone hills and behind the famous Chesil Bank. It is a gateway village to the Jurassic Coast, making it a very popular place with tourists all year round. There is much to explore in Abbotsbury from the lovely quaint streets, thatched cottages, tearooms and shops to the church and many famous attractions such as the Abbey and Tithe Barn, the Swannery, Subtropical Gardens, St. Catherine’s Chapel, Abbotsbury Castle and Chesil Beach. The Swannery was established in the 1040’s by the Benedictine Monks who farmed the swans for their lavish banquets at the abbey. The Subtropical Gardens was established in 1765 by the first Countess of Ilchester as a kitchen garden for her nearby castle. The Bird Sanctuary is over 600 years old and is located on The Fleet, a natural haven for birds. The Olympic Torch will pass through Abbotsbury on 12th July on its journey to the Olympic stadium in London. St. Nicholas Church and cemetery dates from the 14th century and the tower contains three bells dating from 1773. This medieval church stands on high ground in the village and has been designated by English Heritage as a Grade 1 listed building. Next to the church is the site of Abbotsbury Abbey, a Benedictine monastery, dedicated to St. Peter. It was founded in the 11th century, and became a local centre of power controlling eight manor houses and villages. During the late Middle Ages the abbey suffered much misfortune due to the Black Death and repeatedly being attacked from the sea hence reducing its power. In 1539, at the time of the dissolution of monasteries, Abbotsbury Abbey was ruined by Henry VIII so that its stone could be reused. The gable end the only remaining part of the abbey can still be seen today. The Great Barn or the Tithe Barn, which at 272ft by 31ft is the largest thatched building in the world, was built by the Benedictine Monks in the 1390’s and today is a children’s farm. The 14th century St. Catherine’s Chapel is a small stone built chapel, named after the patron saint of spinsters, and sits on top of the 260ft hill that dominates the area round the village. The Tithe Barn and St. Catherine’s Chapel survived the dissolution and the chapel was used as a lookout across the sea. Both are Grade 1 listed buildings and Scheduled Ancient Monuments and along with the remains of the abbey they belong to English Heritage. Abbotsbury Castle is a triangular Iron Age hill fort situated on top of the limestone hill about a mile and a half outside of the village. The memorial post on the path up to the fort is where a beacon stood in the Tudor period and was part of a network along the coast. It was last lit 400 years ago to warn of the approach of the Spanish Armada. The fort is enclosed by a double rampart of earthen banks which encircle an area of about 4 acres. Inside the enclosure you can make out the foundation outlines of huts otherwise there is little to see on the castle site except the stunning views of Chesil Beach and Lyme Bay. West Bexington is a small village situated on Chesil Beach not far from Abbotsbury. The car park is at the end of the road where it meets the beach. On the beach to the right is West Bexington nature reserve which is one of the Dorset Wildlife Trust’s few coastal reserves. The reserve is internationally important because of the rare vegetated shingle habitat that thrives there. The National Trust purchased land in and around West Bexington to preserve the pebble bank of Chesil Beach which is a Site of Special Scientific Interest as well as an Area of Outstanding Beauty and the Trust leases out land and buildings within its boundaries. The village is very popular for its all year round fishing and sea fishing from Mackerel in the summer to Bass in the Autumn with Cod, Plaice, Dabs, Flounders and many other varieties throughout various times of the year. The Dorset coast also has an international reputation for fossils so get down on those beaches and get hunting. Chesil Beach or Bank is one of the most stunning features of the Jurassic Coast. It is a shingle barrier ridge (98.5% flint and chert pebbles) 18 miles long and about 160m wide and rises to 12m in height. The shingle mound of 100 million tons of pebbles, the largest in the UK, connects Portland to Abbotsbury and continues to West Bay near Bridport. Eastwards from Abbotsbury the lagoon of the Fleet separates the beach from the land and the Fleet is Britain’s largest tidal lagoon. The beach, which moves 16ft (5m) inland every century, dates back 6,000 years and is driven onshore during rising sea levels. The South West Coast Path which runs along Chesil Beach at Abbotsbury is a 630 mile continuous footpath, the longest National Trail in the UK, along the coasts from Minehead in Somerset to Devon and Cornwall and ending at South Haven Point near Poole in Dorset. The views and the countryside along this fantastic trail attracts many artists, photographers, birdwatchers, botanists, geologists, historians, archaeologists and of course many walkers, tourists and sightseers. The Jurassic Coast the UK’s first natural UNESCO World Heritage Site and an Area of Outstanding Natural Beauty stretches 95 miles from Orcombe Point near Exmouth to Old Harry Rocks on the Isle of Purbeck. The coastline provides a continuous sequence of Triassic, Jurassic and Cretaceous rock formations spanning 185 million years of the Earth’s history. We park in Abbotsbury village car park and walk left down the road. At the end of the road we turn left following the sign for the Swannery ½ mile, then just after St. Nicholas Church we turn left at the sign for Abbey tea room, go through the arch and then turn right through the gate at the sign Tithe Barn and Swannery passing the ruined gable end of the Benedictine abbey. 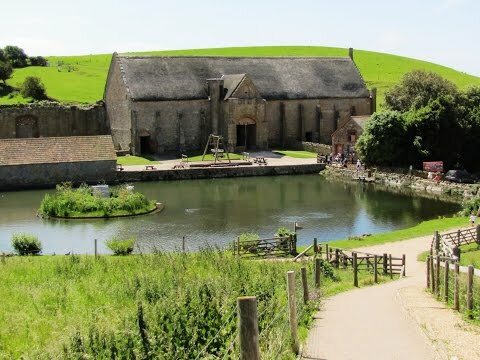 We head to the Tithe Barn and the pond we can see in front of us then make our way to back to the road. After a short way we take the footpath on the right going downhill and after passing a field with a variety of chickens and bantams we turn right just before a building. We follow the path go over a stile into open ground and follow the path straight forward passing a stone sign Coastal Path Chesil Beach 1 mile then at the next stone sign we turn right uphill to St. Catherine’s Chapel. After a look in the chapel we turn back and make our way along the top then head down back to the coastal path and keep head right round the hill. We pass two World War II pill boxes and walk downhill to the gate in the hedge line in front of us we turn left through the gate and follow the track to Chesil Beach. We turn right along the edge of the beach after a short way we pass a car park with toilets and a cafe on our right and continue forward on the tarmac track, for easier walking, to West Bexington passing Lawrence’s Cottage and the Old Coastguards on our right. When we reach the car park on the beach at West Bexington we turn right slightly uphill through the village passing Manor Hotel on the right and when the road bends to the left we head straight forwards up the footpath signed South Dorset Ridgeway and Hardy Monument 6 miles. The path goes steeply uphill towards the B3157 but just before we reach the road we turn right going through a gate way with a sign post South Dorset Ridgeway and a yellow arrow and keep heading uphill. Just after a seat we come out onto the road at a lay-by and go through the gate opposite and follow the ridge path across the field with the hedge line on our right we keep to the grassy path through some bushes and pass an old well or look out. We keep heading forwards through a gate and open ground and head up the scared path over Tulk’s Hill which we can clearly see in front of us. When we reach the road we cross straight over and follow the grassy path up to Abbotsbury Castle an Iron Age Hill Fort we continue forward with the sea on our right go through a gate and drop down to cross a lane. We continue along the flat top of Wears Hill until we reach a gate we go through the gate and take the right hand grassy path and follow the signs back to Abbotsbury village. At the lane either, turn right, left and left again or turn left then right to the car park. This is a moderate to hard walk with some steep inclines and declines, field paths and rough tracks, and walking on the shingle beach is difficult. Approx 8.75 miles allowing 3 hours 5 minutes using OS map OL15, Purbeck & South Dorset. Abbotsbury is in South Dorset on the southern coast not far from Weymouth. Abbotsbury is on the B3157 between Weymouth and Bridport. The cark park is on the left next to The Swan Inn on entering the village from Weymouth. There are no public toilets in Abbotsbury but for refreshments there are two pubs Ilchester Arms and The Swan Inn, five tearooms, farm shop and Chapel Lane Stores. There are public toilets and a cafe in the car park on Chesil Beach and also in the car park at West Bexington which also houses the Manor Hotel. There are public toilets and many shops, pubs, cafes and restaurants in nearby Weymouth and Bridport.